The night before heading up to Michigan's Upper Peninsula, I thought it'd be wise to mount up some bindings on my skis so I could actually get down the epic Marquette Mountain. 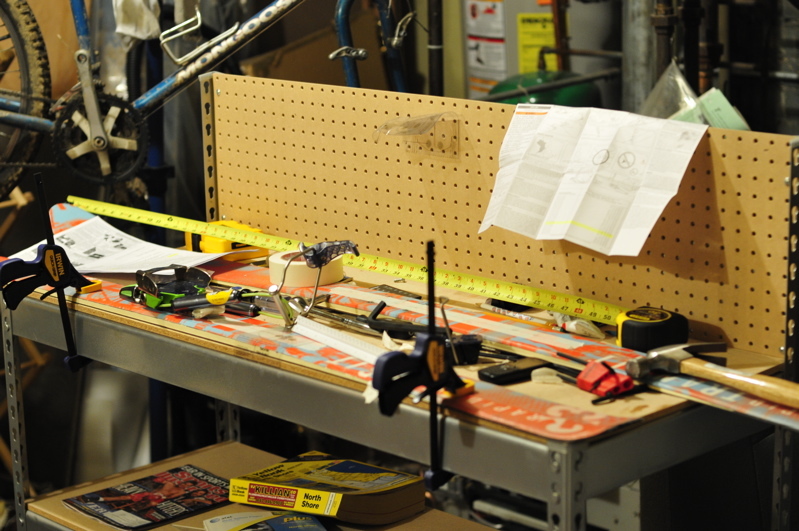 I had already removed my 22Designs Hammerhead bindings from my G3 Rapid Transit skis, with the intention of mounting some Black Diamond 01 bindings. Shockingly, I put this all of to the last minute. Luckily, I already had good instructions from Funk (a seasoned DIY binding-mounter), made a few trips to my local ACE hardware store for miscellaneous tools and stuff, procured a work table from a generous neighbor, and was ready to through caution to the wind. Documenting the whole mounting operation didn't really go as well as planned, but luckily the mounting went pretty well. The above picture is somewhere between drilling the first set of holes in my skis (a bit scary the first time around) and locating the heel piece position (not too scary). All things considered, it went pretty well and my skis are fully operational. I'll take more/better pictures when I mount the old Hammerheads on my new Black Diamond Kilowatts (courtesy of SteepandCheap).